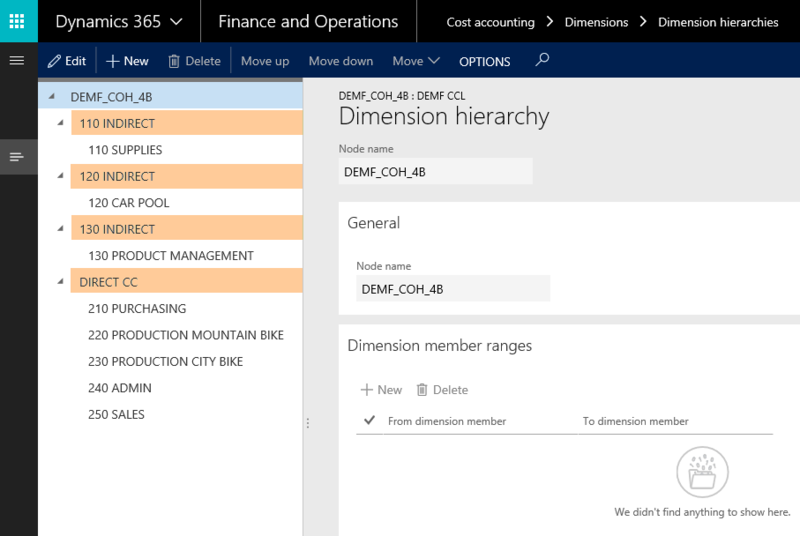 This post continues the previous one in a way that allocations are made once again by referring to summary nodes in a dimension hierarchy. 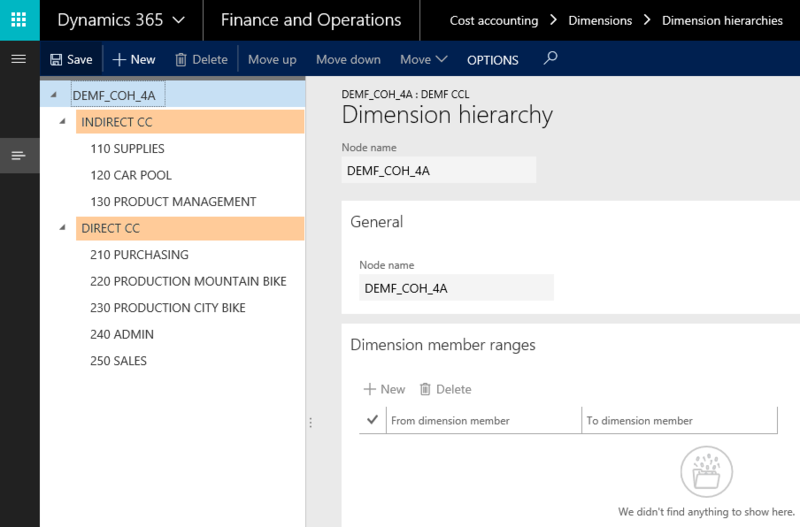 However, this time multiple allocation bases – shown in the next overview graphic – are used for making the allocations. 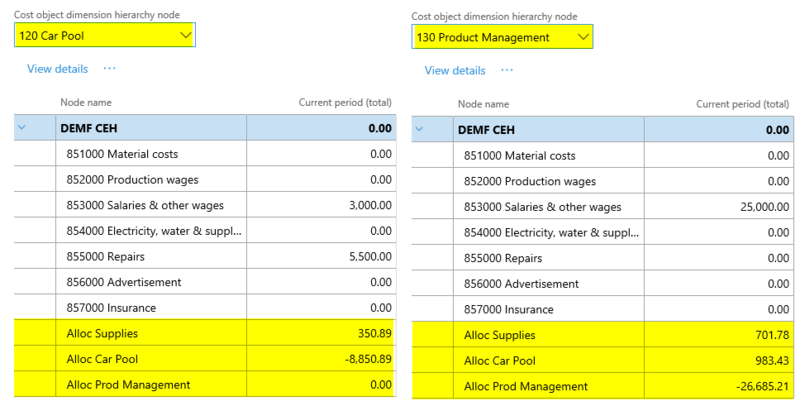 To realize the multiple base hierarchical allocation approach, a new cost object dimension has been setup that includes three additional summary nodes (‚110 INDIRECT’, ‘120 INDIRECT’ and ‘130 INDIRECT’). 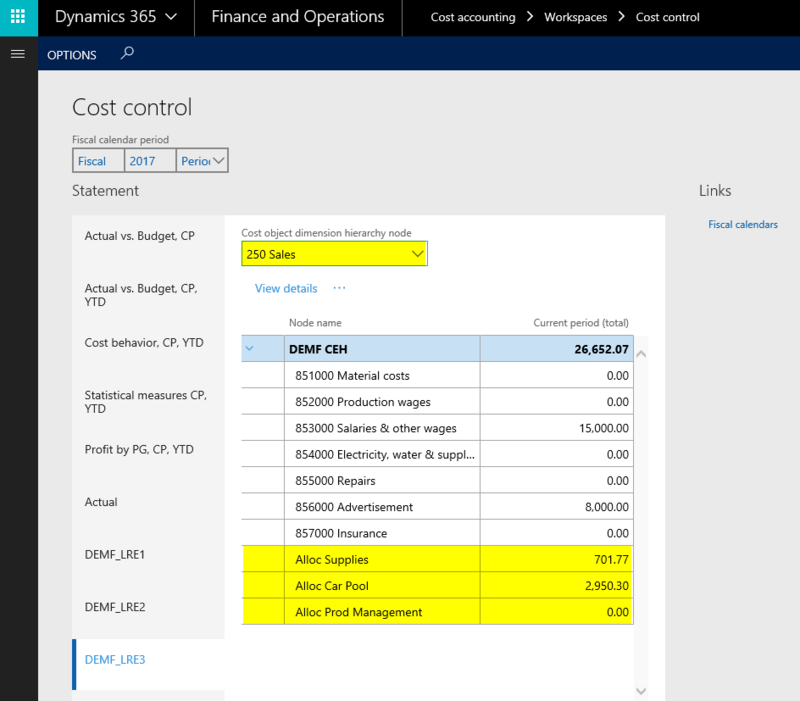 In the example used, each of those summary nodes holds a single cost center only. 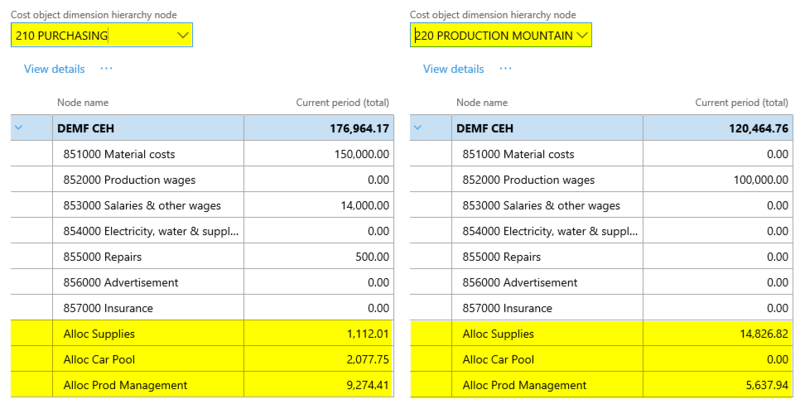 In practice, each summary node typically holds multiple cost objects that are allocated to other ones by making use of the same allocation base. 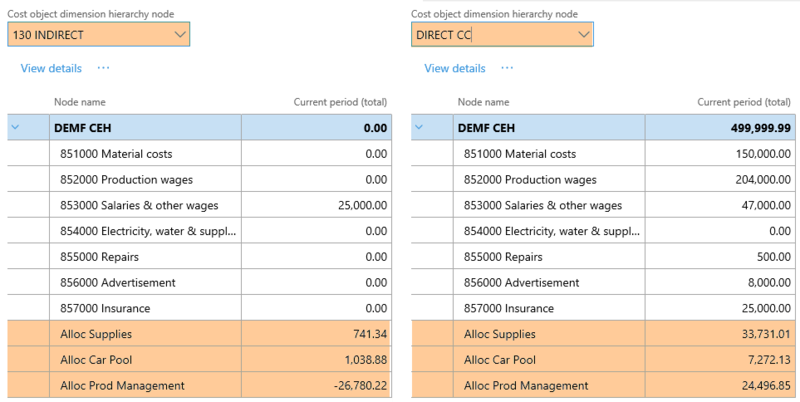 With the new cost object dimension hierarchy in place, one can then refer to the different indirect summary hierarchy nodes when setting up cost allocation policies. 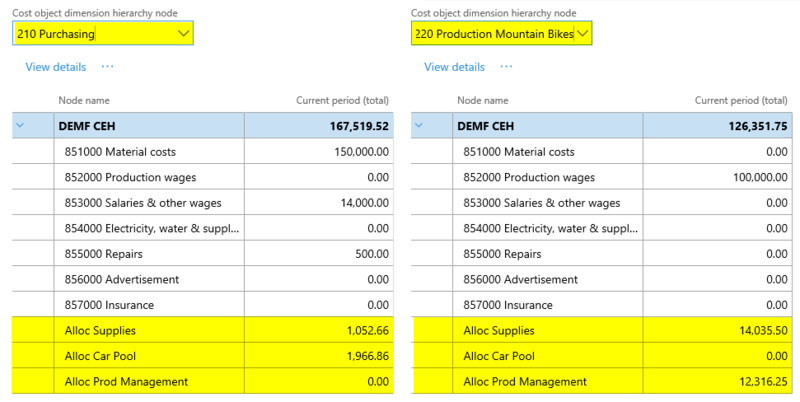 This is exemplified in the next screenprint that shows how the different indirect cost object nodes are linked to allocation bases for cost allocation purposes. 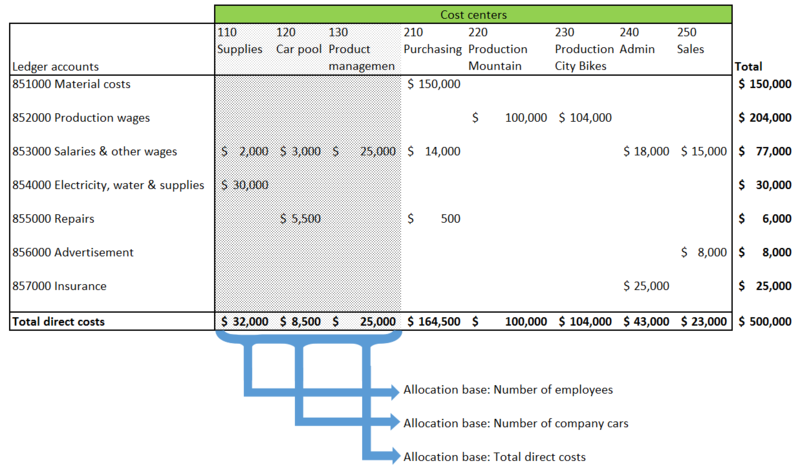 In the example illustrated in the previous screenprint, all cost centers (respectively their costs) that belong to the ‘110 INDIRECT’ hierarchy node are allocated to the operative or ‘direct’ cost centers based on the number of employees working there. 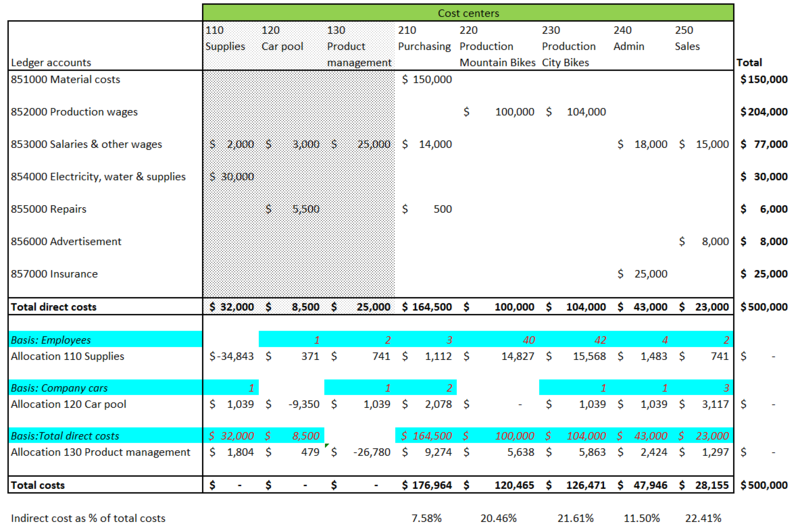 The cost center costs of the ‘120 INDIRECT’ group are allocated based on the number of company cars and the cost center costs of the ‘130 INDIRECT’ group are allocated based on the total direct costs of the other ‘direct’ or operative cost centers. 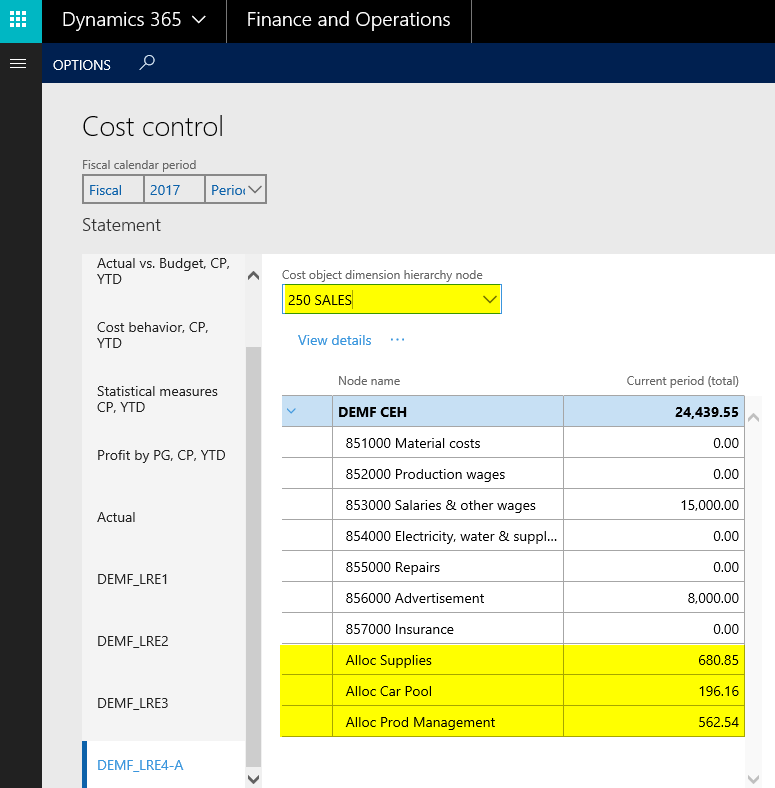 This example illustrates once again that previously used statistical measures and formulas can be re-used multiple times in the new D365 cost accounting module. This ability can be very beneficial for example if one wants to run simulations or tests based on previously used allocation bases. 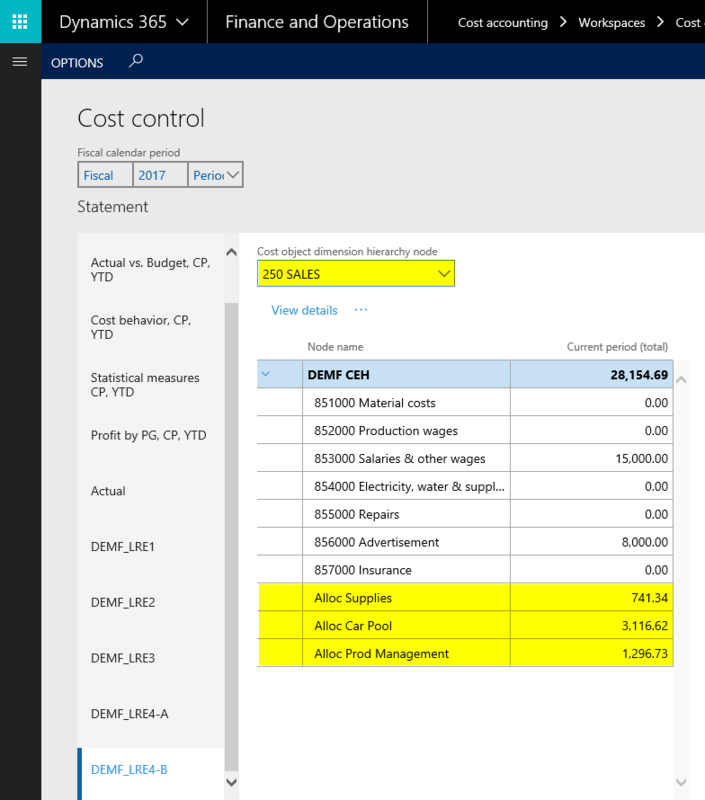 As in all prior posts on cost allocations, the next screenprints document the obtained allocations and are summarized in an Excel document at the very end of this post. 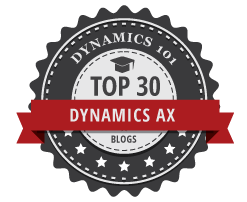 In the next post, we will investigate how one can make use of hierarchy allocation bases. Till then. 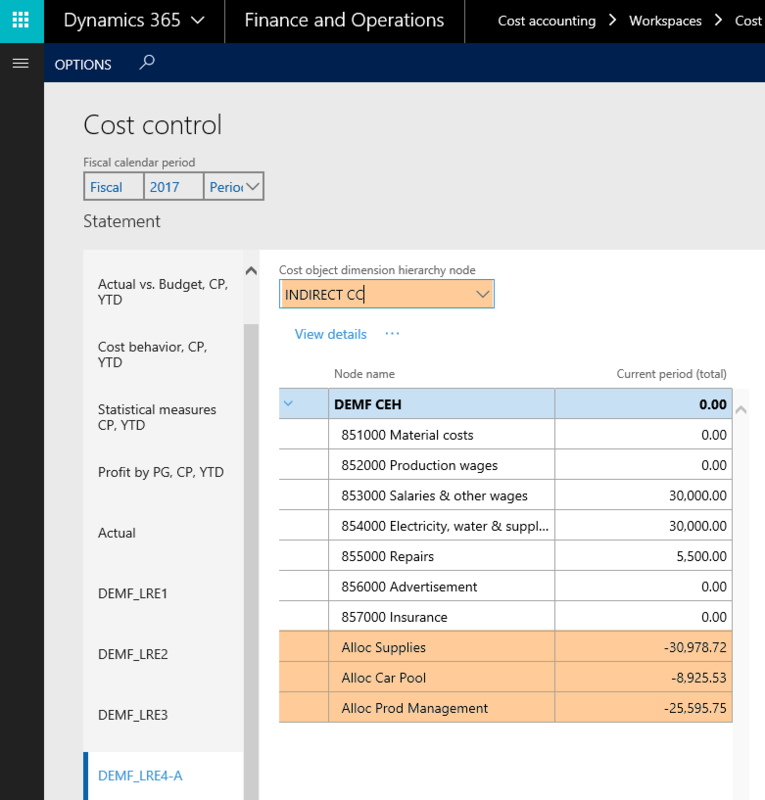 Within this post, we will once again use the financial data that have been used in all prior post on cost allocations. However, this time all costs that have been accumulated on the indirect cost centers no. 110-130 will be allocated to the ‘direct’ or operative cost centers no. 210-250 by making use of a specific cost object hierarchy setup that is illustrated in the next screenprint. 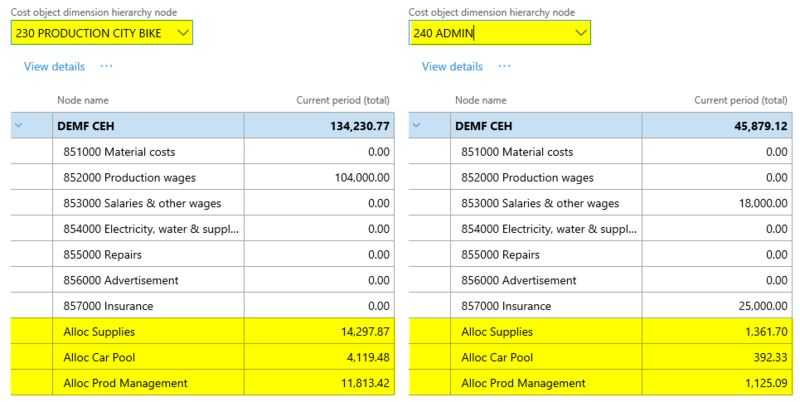 The major difference to the cost object hierarchies that have been used in the previous posts is that two additional summary nodes (‘INDIRECT CC’ and ‘DIRECT CC’) have been introduced. 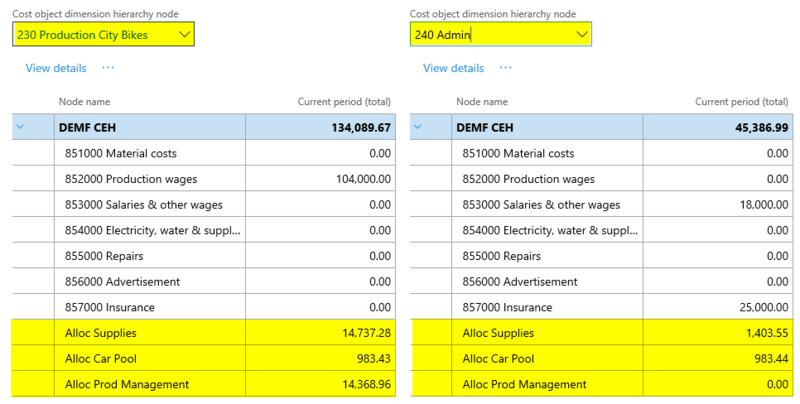 As those additional nodes summarize the cost centers below, they can be used for cost allocation purposes in the cost allocation policy form, which is shown below. 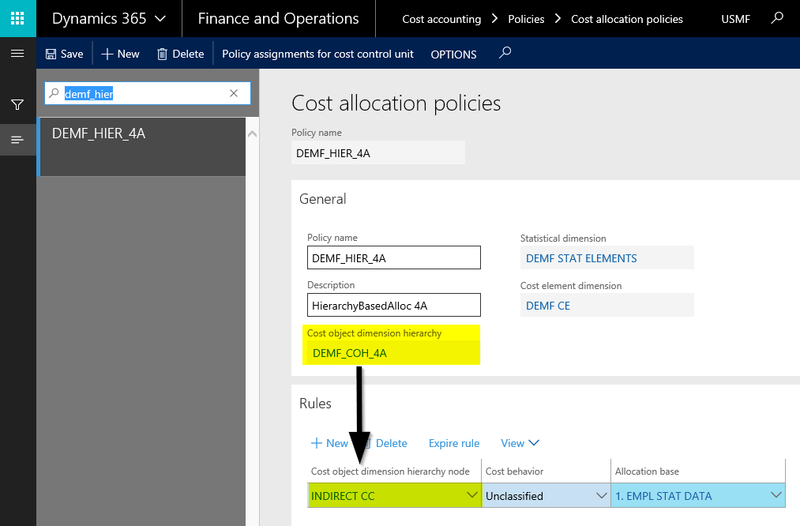 The cost allocation policy form shown above specifies that the cost of all cost centers that are associated with the ‘INDIRECT CC’ node will be allocated to the other direct cost centers based on the number of employees working for those cost centers. 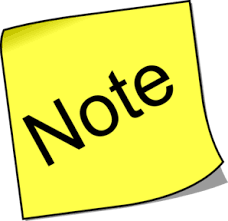 Please note that the employee data that will be used for making the allocations are the same that have been used in the prior post. Making use of them does not require to import another Excel file with the statistical measure data or something alike. 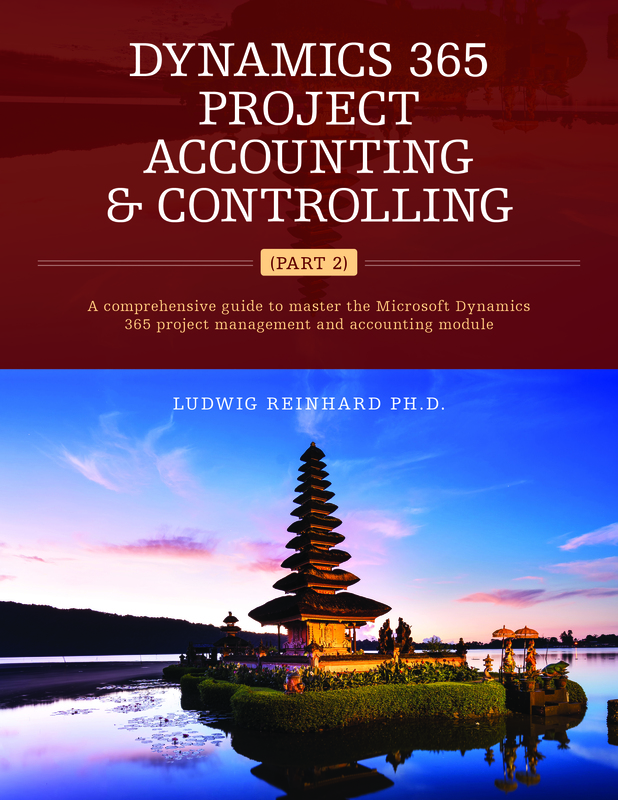 The only thing required is that a link between the statistical measure(s) and the cost accounting ledger is established. As this establishment and the related processing steps are identical to what has been shown in the previous post, those steps are skipped for reasons of brevity. 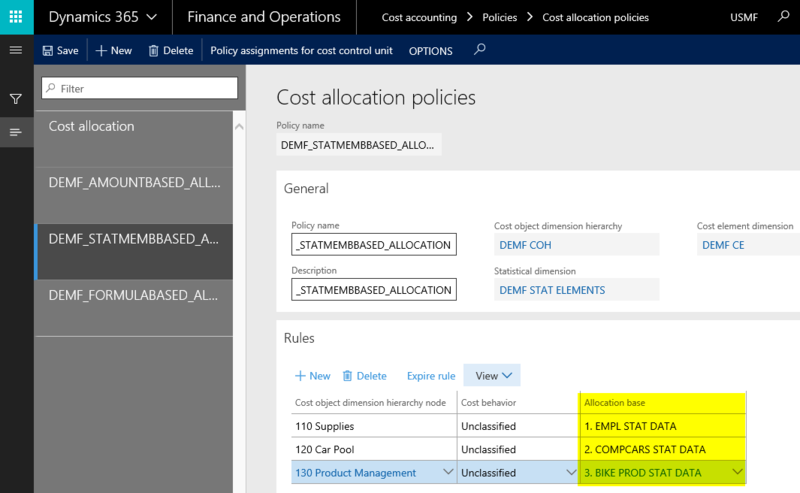 The next screenprints document the allocations that result from the cost allocation policy shown above. As in the prior posts, the following Excel screenprint summarizes the allocations made together with the basis values that were used for making those allocations. 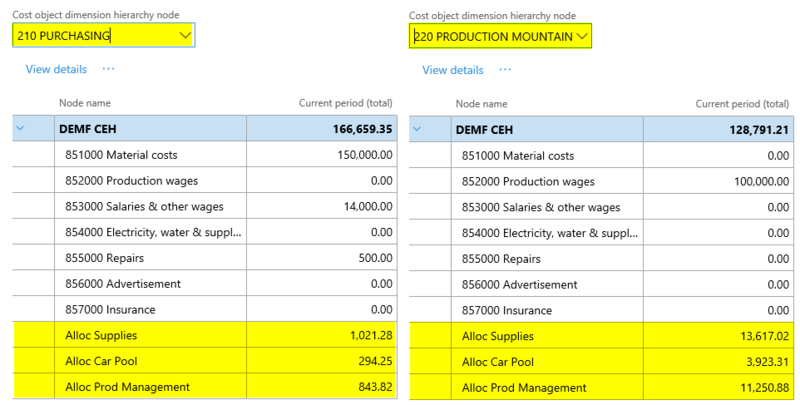 The next post extends this one and shows how multiple cost object summary nodes can be used for making cost allocations. Till then. 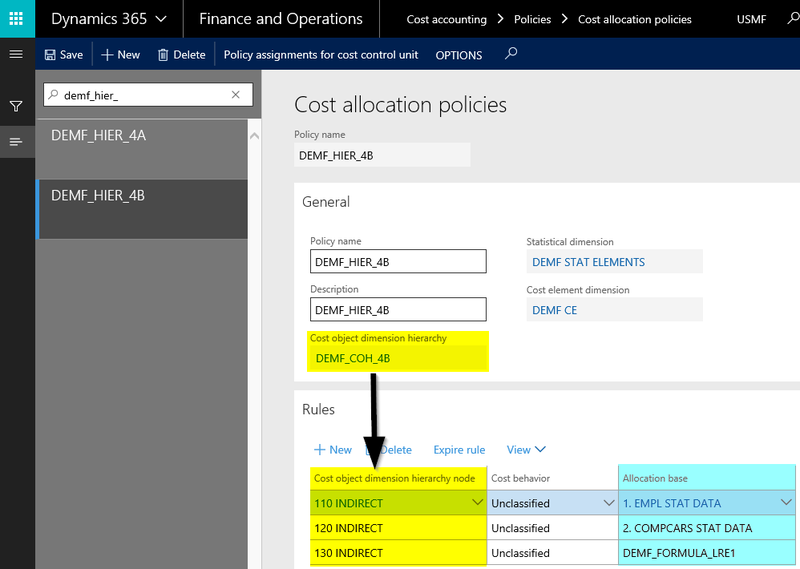 This post builds upon the previous one and illustrates a third cost allocation approach that can be used in the standard D365 application. 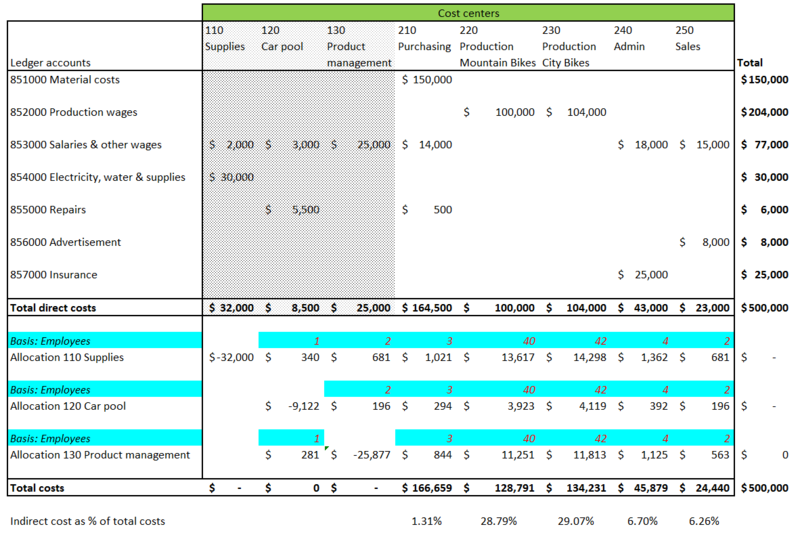 The third approach illustrated below makes once again use of direct costs that were recorded in the financial modules. 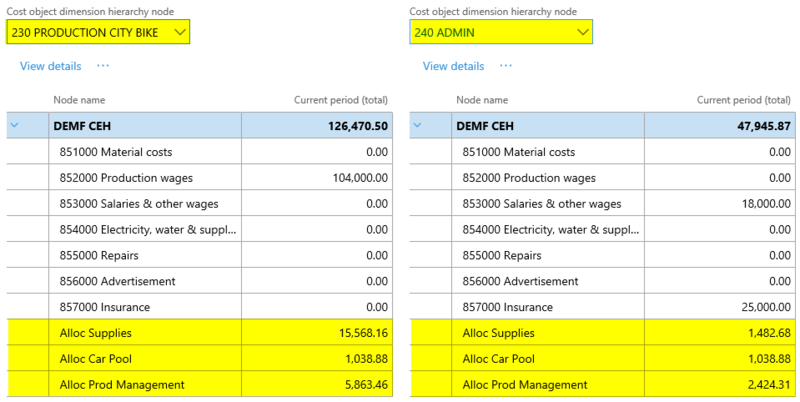 This time, the allocations are made based on different statistical dimensions (no. of employees, no. of company cars and production data) that are setup as statistical members in a first step. Because the statistical data that are used for the cost allocations are not tracked in D365, they need to be imported via the data management framework. 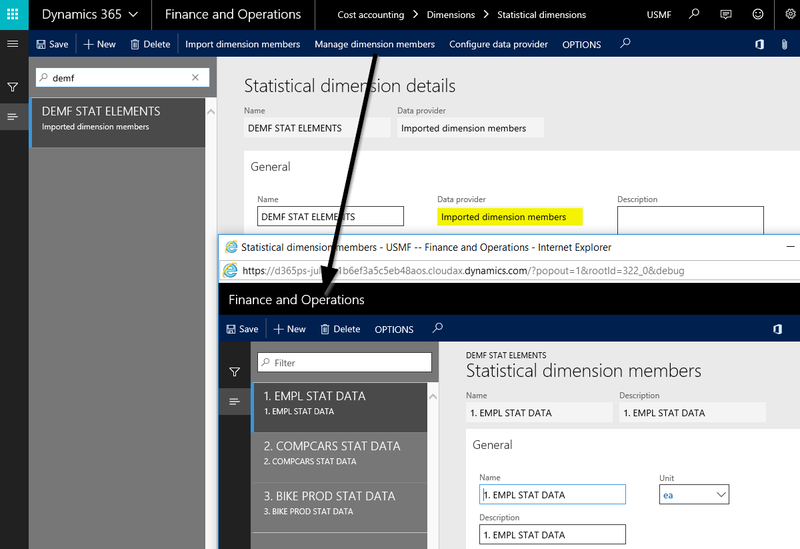 In the example used, the statistical dimension member data were prepared in an Excel file that was uploaded through the data management import framework. The target fields of the respective data entity and the uploaded Excel data are illustrated in the next screenprints. Once the statistical members are defined and the statistical member data uploaded, the allocation policy can be set up. This time in a way that the costs of the first supporting cost center no. 110 are allocated based on the number of employees working in the other cost centers. 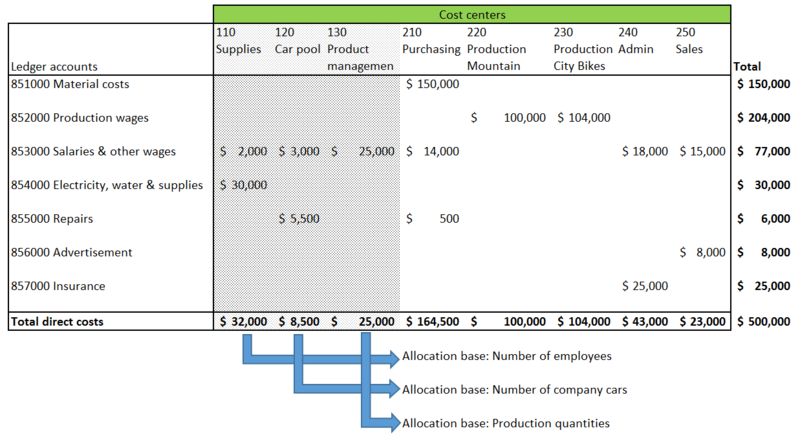 The costs of the car pool cost center are allocated to the other cost centers based on the number of company cars used there and the costs of the product management costs are allocated to the other operative cost centers based on the number of bikes produced. 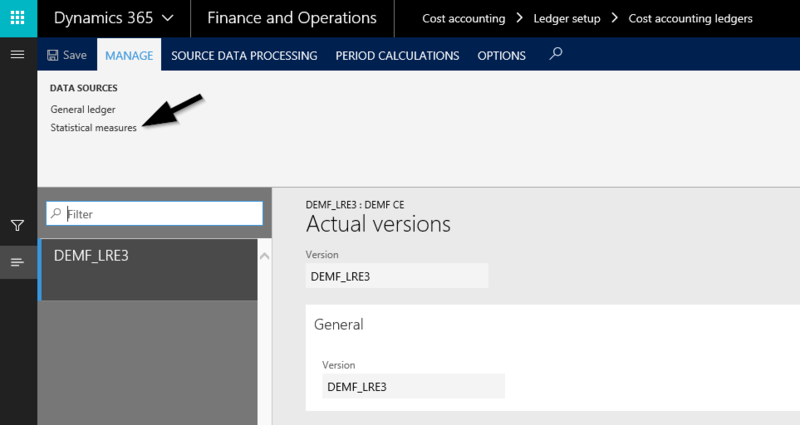 Next, a cost accounting ledger is setup and the statistical measure data provider configured. 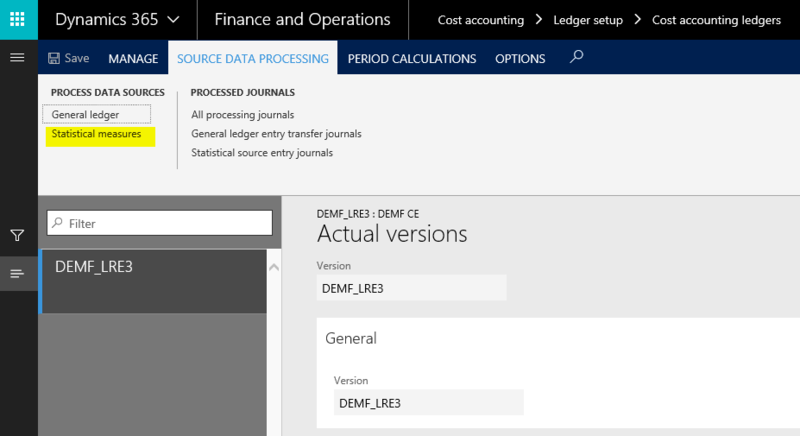 This configuration is done in a way that a link to the import source identifier from the uploaded Excel file is made. 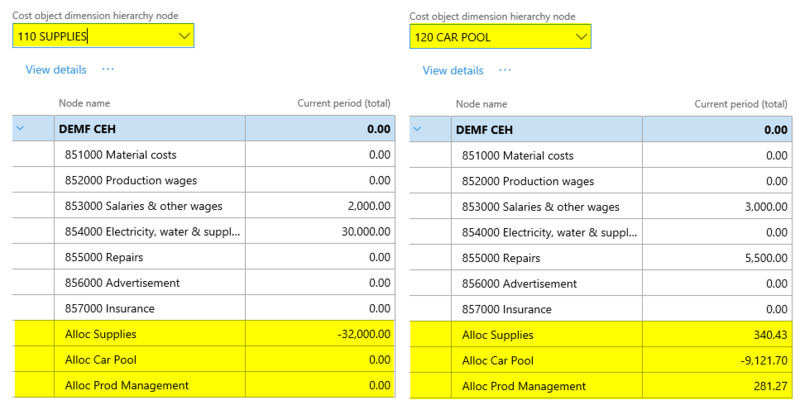 In addition, a link to the Excel column that includes the cost object data must be established. As an example, in the screenprint above it is specified that statistical data for the employee statistical measure are imported. 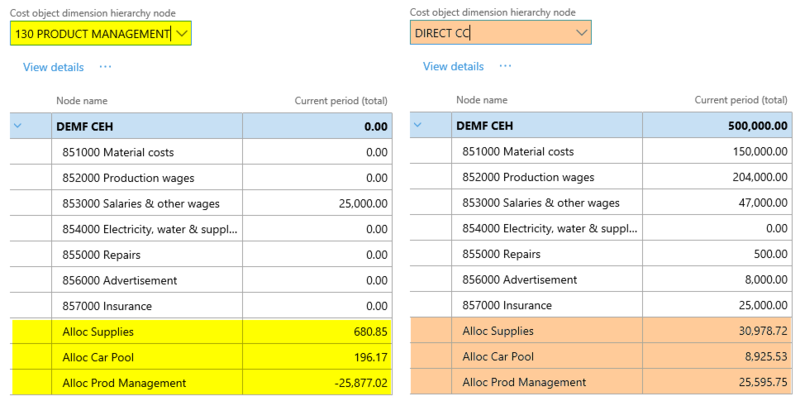 Through the dimension mappings field, one can determine the column of the Excel document that holds the cost object data. In the example used that information is tracked in the ‘dimension2’ column. For details, please see the Excel screenprint further above. Once this setup is made, the statistical measure data need to be processed, that is imported into the cost accounting ledger. All other processing steps are identical to what has been shown in the prior post and for reasons of brevity skipped. 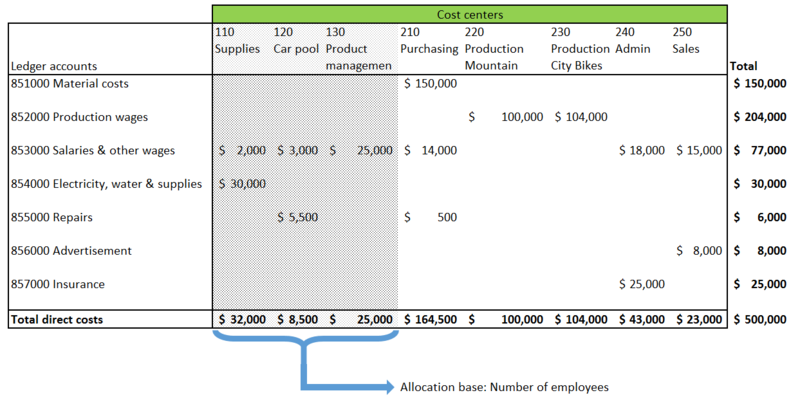 As in the previous posts, the next illustrations summarize the different cost center costs and allocations. 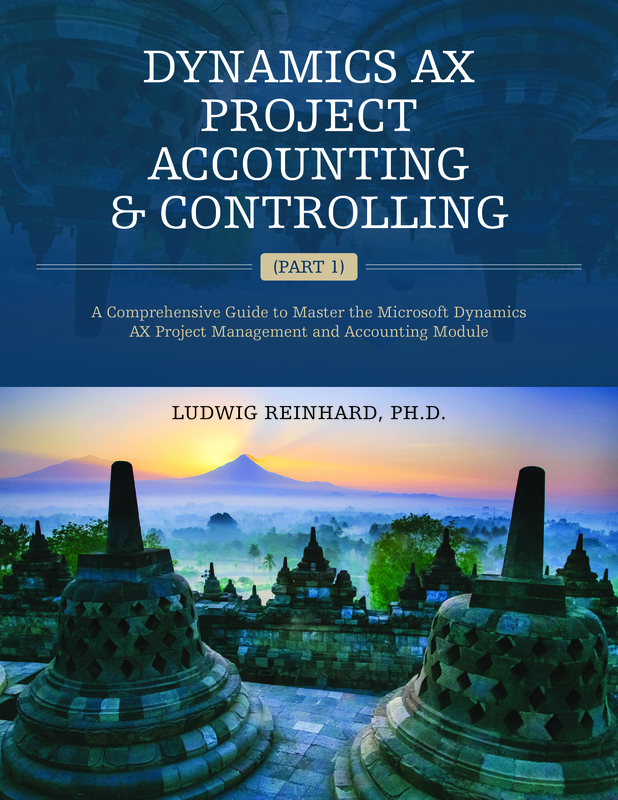 The next screenprint summarizes – as before – the executed allocations for the different cost centers together with the allocation basis measures that have been uploaded. In the next post, we will focus on another (hierarchy based) allocation technique. Till then.